THERE is much hope that the Butuanon River in Mandaue City will be rehabilitated, and some local and foreign students are helping make sure it happens soon. Now on its second year, the Pressure Cooker Challenge dubbed as the Mandaue City Scan Challenge 2018 is a collaborative activity of the Rotterdam University of The Netherlands, the University of San Carlos (USC), the City of Mandaue and the Ramon Aboitiz Foundation Inc. (Rafi). The subject of the challenge is the Butuanon River, which traverses five barangays located in Mandaue City. Eight Dutch and 16 USC students will work together in six teams for 10 days to analyze the quality of the river’s water, assess the plastic pollution, and raise awareness on the condition of the river. Last Nov. 12, an opening ceremony was hosted by Mandaue City Mayor Luigi Quisumbing at the Mandaue City Session Hall. Representatives of the schools and Rafi’s senior program officer Elisabeth Baumgart attended the event. The first day of the River Scan Challenge focused on exposing the students to the City of Mandaue and the Butuanon River. The whole-day event started with presentations from experts, including Rick Heikoop, Living Labs coordinator of the Rotterdam University of Applied Sciences, and Dr. Floris Boogard, water quality monitoring expert of Hanze University of Applied Sciences. 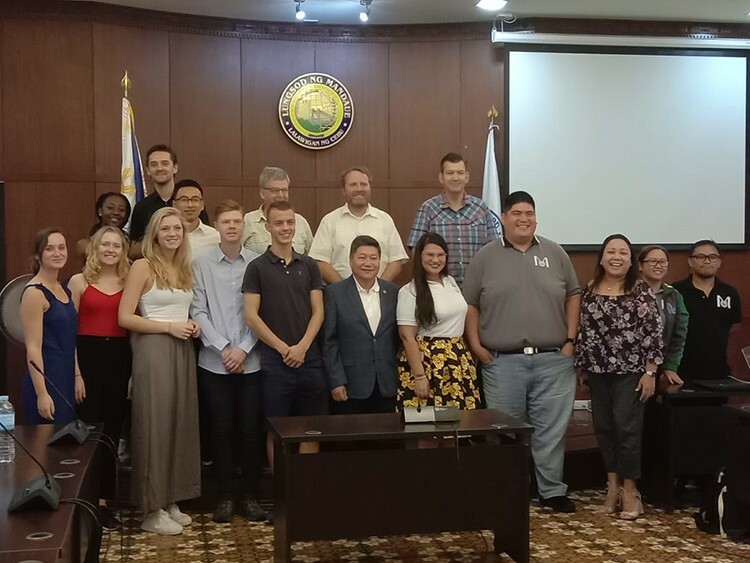 Architect Marlo Ocleasa, the officer-in-charge of the City Planning and Development Office, and Architect Araceli Barlam, the officer-in-charge of the Mandaue City Environment and Natural Resources Office, presented Mandaue City’s profile and the state of the Butuanon River to the participants. The goals of the Mega Cebu Project were also presented by architect Joseph Michael Espina, the dean of the USC’s School of Architecture, Fine Arts and Design. In the afternoon, the group visited the Butuanon River. The USC representatives are Civil Engineering students Charles Mari Ramos, Rachel Ann Castaneda, Shiela Mae Terante, Alexandrea Yap, Jan Carl Abad, Leonard Borbon, Ma. Luisa Zapanta, Hazel Olive Parmes, Jesi Martin Maglana, Matthew Dy, Emmanuel Nicholas Labuen, Chemistry students Keisha Dianne Achumbre and Adam Ramirez, and Biology students Yobert Juanillo, Jodivine Navarosa and Peita Jovero. The Rotterdam University representatives are Water Management students Floris Huisman, Marie-ClifCazal, Moushan Lim, Mandy Kluts, Eva Ijzerman, Sven Breukhoven, Mila Diemel and James Dudley-Owen. Team advisers are engineers Jonah Lee Bas, Kathrina Borgonia and Stephanie Cañete, Sir Lief Duncan Urdanete and engineer Arnold Sab-a.